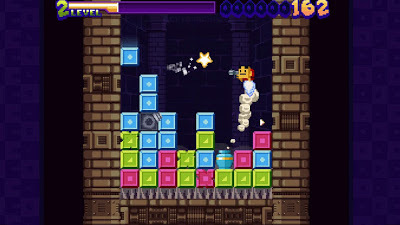 For those of you new to the game, the concept is painfully simple: our cape-wearing, laser-pistol-wielding hero starts the game on a single row of coloured blocks above a floor deadly spikes/lava below. More coloured blocks drop from the sky above. 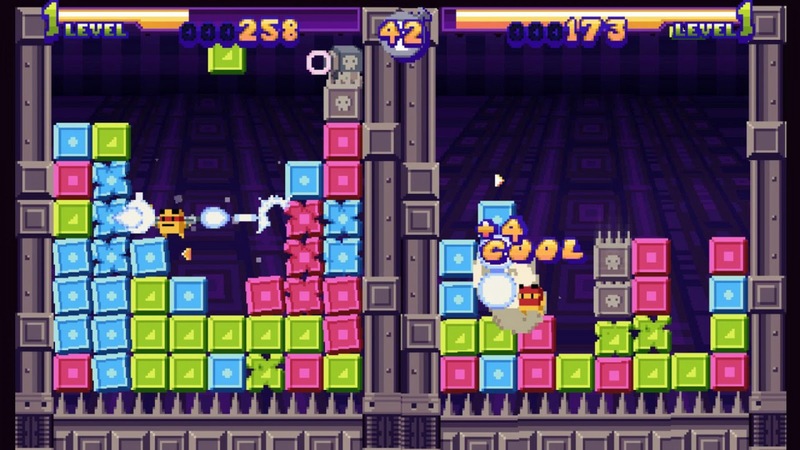 Shooting at single or groups of matching colour blocks rewards you with 'block bits' that power up your weapon, whilst getting squished by falling blocks causes you to power down. Add to that a plethora of level-themed hazards, beautiful low-resolution pixel art, an amazing soundtrack from Landon Podbielski (which is also available to buy as a standalone album) and pretty-much perfect execution and you have a delicious mash-up of game concepts that work so well together it begs the question "why has this not been done before?". Much like in the original SPP, there is no win situation when playing each level - the game is endless and becomes increasingly difficult, throwing blocks and hazards at you until you eventually die. 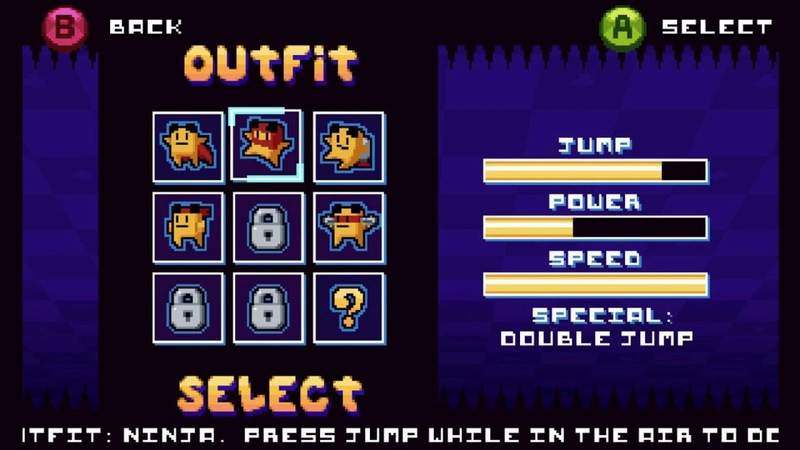 Progress through the game is therefore achieved by collecting a target number of jewels on each world, and unlocking each of the different characters and challenge games requires similar star/jewel/block bit milestones to be met. The challenge modes are a particular highlight, with the game facing you with 18 deviously designed encounters against individual hazard types. Needless to say, mastering them really helps to develop your play style in the main game (and of course, these make up the bulk of the 35 Steam achievements). Following on from their previous Steam release of the excellent and deservedly-hyped Super House Of Dead Ninjas, Adult Swim's shift to publishing 'full-fat' versions of indie titles is fast transforming them from what many considered to be a casual-centric company with a killer sense of humor to a serious gaming studio whose focus to date seems to be directly aimed at a generation who grew up on a diet of 16-bit consoles and coin-op arcades. In case you hadn't guessed already, that's a fair description of yours truly, so it has been really hard not to be biased in this write-up. There is no denying that I completely and totally love Super Puzzle Platformer Deluxe, but that said, it isn't quite flawless (yet). 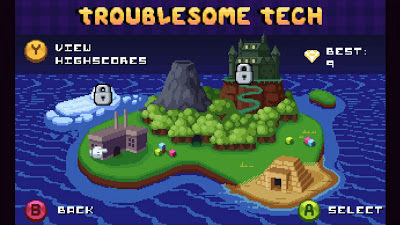 The complaints directed at the game on the Steam forums concern two key areas - a lack of any tutorial, how-to-play-guide or instructions and the limited to local multiplayer. To be fair, I don't think that the game really needs a tutorial, but a simple arcade-style introductory 'attract mode' introducing the gameplay concept to first-time players wouldn't have gone amiss. However, the long-awaited two-player mode does feel a little underbaked - simply playing like two single-player games running alongside each other with no clear way to interact with your opponents play area via bonuses or score-combo triggers. This is an area that could have definitely been built on further - and although I personally prefer local multiplayer, online vs play is a feature that would bring the game to a much wider audience. However, don't let these (extremely) minor issues put you off. 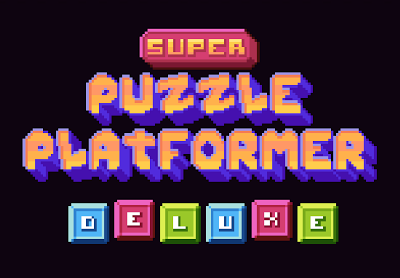 Super Puzzle Platformer Deluxe is a fantastic game that will devour hours of your life. Available until the 31st of May with an introductory 25% off at £4.49, grab yourself a copy now. 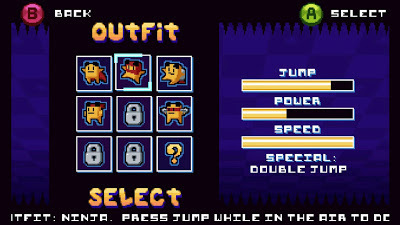 Play the free flash Plus version here (at Adult Swim Games). I couldn't agree more. I picked this up the second I saw it was available; I've been waiting for it since I first played SPP in the browser... much like SHoDN. Personally, I feel the lack of a tutorial gave the game a nice air of mystery and a distinctly old-school feel. It's fun sometimes to figure out things on your own. Finally, I really dug the soundtrack. This one is a must buy regardless of any (small) flaws it does have.